The Principality comprises some 75 Sq. Km. 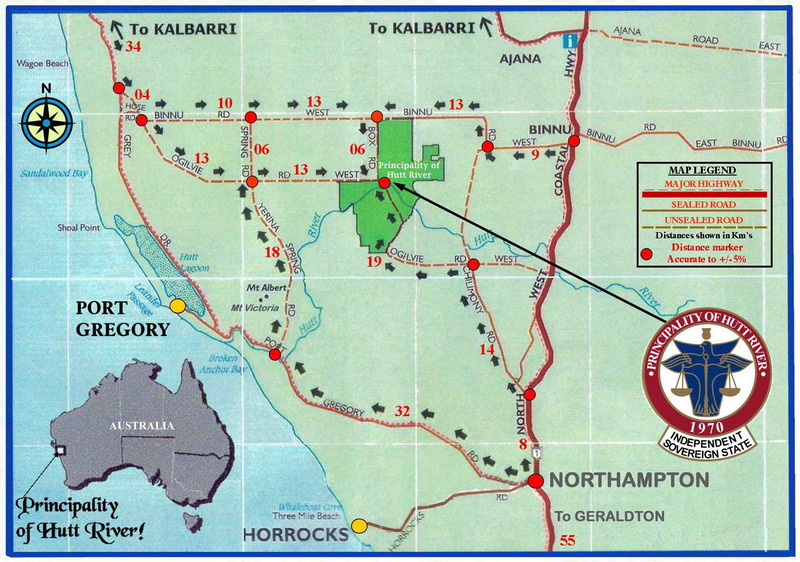 and lies about 26 miles northwest of Northampton on the west coast of Western Australia. There is a small permanent population that may fluctuate seasonally. The Terrain consists of rolling hills of ancient geological origin, partially cleared for grazing and cultivation, with extensive natural preserves. The Principality is named for the Hutt River which cuts through the area. The weather is pleasant from April through October, while the remaining months can be quite warm with summer temperatures reaching up into the high 40's (Centigrade). The prime period to visit is during the "Wildflower Season" where the entire area turns alive with a glorious range of colours as the native wildflowers give off their magnificent show of colours lasting from late August through to October, something the area is famous world wide for.